Foxtail palms are now prolific not just in Brisbane but all over the world in tropical and sub-tropical climates. That’s quite remarkable, considering they were unknown to the world just over thirty years ago. They were brought to botanists attention in 1978, growing in Cape Melville in Northern Queensland. Due to their original rarity nurseries weren’t given access to Foxtails until 1992. The genus are named for Wodyeti, an Aboriginal man who had a great knowledge of the region. ‘Bifurcata’ (twice divided) refers to the distinctive plumlose leaflet arrangement, from which its common name is also derived. It’s a monotypic genus (only having one species), at least so far. In their native environment Foxtail palms reportedly grow to 15 metres. Under cultivation they rarely reach 10 metres. They have largely displaced taller species such as Alexander palms, their comparative shortness often considered an advantage since at height palms have a ‘telegraph pole’ aesthetic to many observers. They have a sturdy, grey trunk with some light signs of leaf scars. Seed pods open to reveal infloresenscences on a stalk connected to the palm tree at the base of the crown shaft. Palm fronds 2-3 metres long with plumose fronds. Foxtail palms are self-cleaning, meaning the expired fronds fall from the tree naturally. Orange-red at maturity, Foxtail palm seeds are the only palm fruit known to be poisonous. They are best managed by removal from the crown shaft when still in the seed pod. Foxtails are easily propogated in cultivation in warm climates. Only mature fruits should be selected and they should be dried if being stored. They remain viable for several months but fresh seeds should be used in following years. In temperate climates seed trays should be heated to 32 degrees Celsius. Foxtail’s natural environment is on rocky ledges among granite boulders. In cultivation they expect the same excellent drainage. 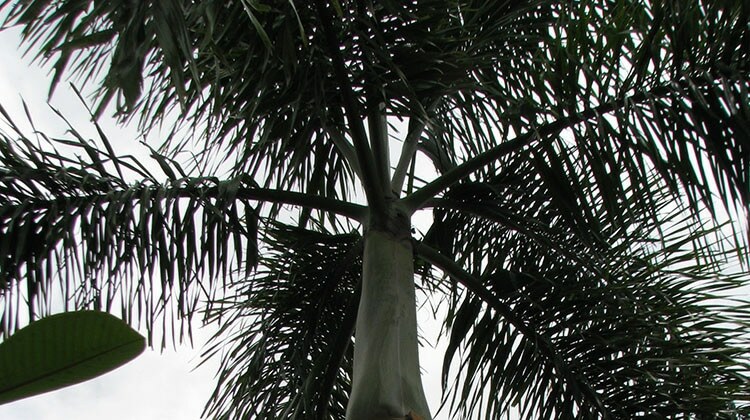 They are reasonably shade and salt tolerant, making them one of the most hardy palms available. They may be fertilised with slow-release palm or general fertilisers. If they aren’t fertilised look out for potassium deficiency. It is identified by necrosis in the ends of leaflets on older fronds and black spotting in the midsections. They may also suffer from Manganese deficiency which leads to leaflet necrosis starting at the base of the leaflet rather than the tips and with black stripes instead of spots. Potassium deficiency in Foxtails can also be compounded by the application of fertilisers high in Nitrogen (lawn fertilisers, for example) close to the tree. The nitrogen is used in substitution for potassium leading to an effective deficiency. Brisbane’s climate is great for Foxtail palms. With monthly watering and annual fertilising with palm fertiliser they should thrive, given good drainage. I have a foxtail palm and have just noticed my new frond is not opening and appears to have died.The tree itself looks healthy.Do we remove this frond?What could be the cause. Hi Colleen. I suggest having a local consulting (level 5) examine the tree. It could be water stressed being raised if the soil is sandy, it could have nutrient deficiencies, or it could be suffering from a pathogen. Let’s hope it’s not the last one. You have more success adding a couple of dessertspoonsful of vegetable oil to your soap spray. I would really like to plant a Foxtail palm in the triangle front “patch” of my house along the driveway and foot path. It is raised and sided by cement on two sides. The place I will put the tree measures only 1.7 meters X 2.5 metres before hitting cement. Is this too small for the root ball? Oh also; I live in Melbourne near the bayside. So my region is a little colder than Queensland. Do you think the climate is a problem? I would really like to plant a Foxtail palm in the triangle front “patch” of my house along the driveway and foot path. It is raised and sided by cement on two sides. The place I will put the tree measures only 1.7 meters X 2.5 metres before hitting cement. Is this too small for the root ball? I would like to plant foxtail palms around my pool area but don’t want them to lift any of the paving. Is that likely? This tree has been planted nextdoor and they only have a narrow strip and so they have spaced as far from their house and right against the boarder fence. So one is over my washing line and the other over my pond and two or three others against rendered block work and painted section of the fence at the top. This neighbour swears top landscaper recommended she uses. But she has not used in way landscaper would lay out, So these plants feed over my side as her side is all house and paving with very little garden area at all. So the other planting is a lime treee in the corner that has killed two peach trees in middle of back yard and she also has a lilly pilly hedge right against the fence. So all these plants vigorous and difficult as the foxtail palms are growing larger than the height they believe as this is the deal across the Sunshine Coast. 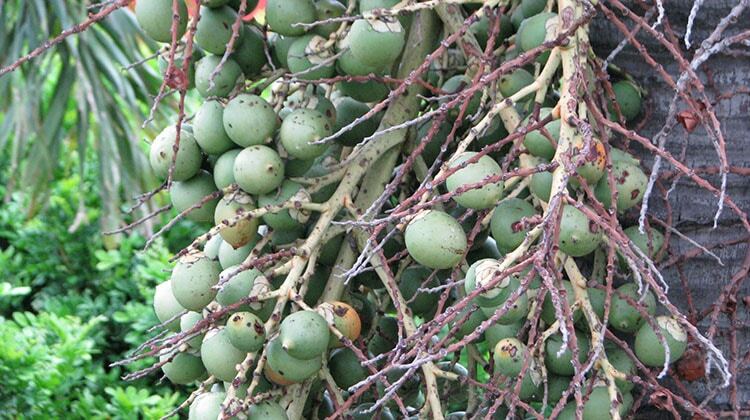 They are becominng huge and not well understood tree here and so the fronds are lethal and big problem when they fall not to mention the poisonous berries. Just their proximity will have them pushing the fence over. The teacher and her developer partner know better but they are playing hardball as they dont want to pay for 50% of the fence as they should and should have a long time ago. What to do? I get you can take them through a legal process and it is indisputable but it should be there is a way of explaining it to them? Can you help? It is a lime tree right in the corner that will reassert itself and have cut the roots and it has taken 2 x 4 hours of work and years of telling them. The lilly pilly is very vigorous and they only sort if THEY are entertaining and then these palms are just so stupid to have been planted there. So you really get upset with people who build all house and have no yard and then plant these vigorous plants that have great vigour in this part of the world ie the Sunshine Coast just north of Brisbane. Help someone succinct and gets plant science and garden practice that could persuade a teacher they are WRONG. I like teachers but there are the occasional ones who you cant get through to as they have to be the authority on everything because they spoke to someone who was an authority but authority has to be in context. Good tree takes room and right against the fence it has another half of its room to spread out and push or go over or undermind the fence. I understand your distress. It can be quite upsetting when a neighbour incringes on your space with their trees. You are right about foxtail palm fronds, too. They do need a safe dropzone in which to land. As you say, you do have legal remedy which you can obtain through QCAT. I’d be happy to talk to your neighbour for you to try to resolve the matter peacefully. Just give me a call with their details. Thank you. It is just that it is all too stupid for words and there are people who have been flooded or suffered damage in storms but to bring up this matter that is so obviously wrong in every respect is just a waste of space and everyones time and well being. Thank you. I will call you Monday. If there is a best time please let me know. Anytime you like is fine, Fi. Foxtail palms are beautiful; this is a lesson that even beautiful trees in the wrong place are weeds. Yes, that is the definition of a weed. They are a beautiful tree and I remember seeing them for the first time up at Townsville and up there the people have really embraced them as an emblem.